Summary: In a society steeped in tradition, Princess Lia s life follows a preordained course. As First Daughter, she is expected to have the revered gift of sight but she doesn’t and she knows her parents are perpetrating a sham when they arrange her marriage to secure an alliance with a neighboring kingdom to a prince she has never met. On the morning of her wedding, Lia flees to a distant village. She settles into a new life, hopeful when two mysterious and handsome strangers arrive and unaware that one is the jilted prince and the other an assassin sent to kill her. Deception abounds, and Lia finds herself on the brink of unlocking perilous secrets even as she finds herself falling in love [x]. Review: I found the audiobook for this and was excited because I had heard a lot of great things about it. A lot of people had given it a high rating… sadly this didn’t really excite me too much. Perhaps there was too much hype around it. Or the media I had chosen to read it in wasn’t right. I’m giving it a 3 out 5 stars because I didn’t love it but I didn’t hate it. I don’t know if I will be looking into the sequel to this as I kind of don’t care what happens. P.S. I’m trying out a new review style with the bullet point of what I liked/didn’t. This entry was posted in audiobook, book review. Bookmark the permalink. Oooh! 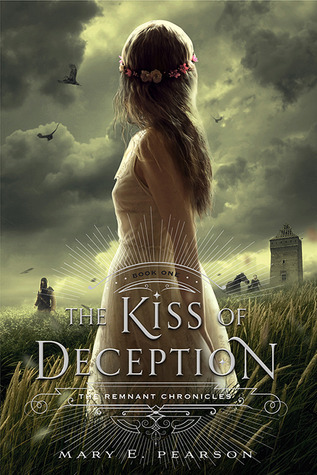 This is actually the first time I've seen a non-5-star review for The Kiss of Deception! I've seen a lot of hype around it too, and I've been thinking about reading it, but too much hype won't let me enjoy it, I think. But anyway, great review, it's good that you didn't end up hating it! I'll still give it a try and see how it goes for me. . .let's hope I don't end up hating it or anything, because predictable books aren't any fun (like Hush Hush by Becca Fitzpatrick)! Thanks for the great review! Really liking this new style! I have spent the last year+ feeling like the lone wolf who did not fawn all over The Kiss of Deception. I swear, everyone raved about it nonstop, I gave in to the hype (big mistake) and was left feeling… meh. I 100% did not see what all the fuss was about. I found the whole thing to just be so unremarkable. It was overly long, the first 3/4 dragged and there just wasn't enough pay-off. I never picked up The Heart of Betrayal and doubt I ever will. Like you, I kinda don't really care what happens. Ha! I'm so glad someone else shares my opinion on this! If you go through Goodreads all the reviews rave about how amazing this book is. I definitely agree with the overly long aspect. All the actual stuff happened in the last 1/4 of the book. And at that point I was just so over it. Audiobooks aren't for everyone! But I agree some voices do not work and that one in particular got in my head. I think I tuned it out to be honest lol. But for sure give this read a go! A lot of people raved about it but it just wasn't for me. I haven't read Hush Hush! But I probably won't because I hate predictability. I'm a person that usually doesn't see things coming easily so when I can figure out what's happening early on I get really disappointed in the book. I'm glad you like the new style!